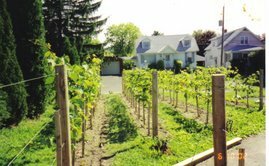 In planning my vineyard back in the year 2000, I knew something about wine making but nothing about what, if any grapes could be grown for wine making in the Capital District of New York State. I did a lot of research online and I looked to local vineyards for guidance. There were exactly one (1) vineyards growing wine grapes within an hour of my home. "This is not a good sign" I thought to myself. The next obvious question was, "why?" I was fortunate enough to stumble across the Cornell University website which just happens to include a plethora of viticultural information. This is due to the Finger Lakes AVA grape growing region. This AVA (American Viticultural Area) I found to be the most similar to the climate in my backyard. Using online historical weather databases, the information all said "you can't grow high quality wine grapes in your backyard." I guess that's why there was only one tiny little nothing of a commercial vineyard anywhere near my house. "Great, now what?" Because I was NOT about to give up on my plan for a home vineyard! So I read, and I read, and read some more. I went from having no idea what the difference was between the grape varieties used to make a French Bordeaux and a California Meritage. (there is no difference for the most part) I learned that most European wines are not named after the varietal that they are made form, while most new world wines are. I learned about the red varietals: Cabernet Sauvignon, Cabernet Franc, Merlot, Malbec, Syrah, Zinfandel/Primitivo, Sangiovese, Gamay, Pinot Noir, Petit Verdot, Tempranillo just to name a few. The white varitetals: Sauvignon Blanc, Chardonnay, Riesling, Viognier, Pinot Grigio, Pinot Blanc, Semillion, to scratch the surface. I had made wine from some of these varietals like Cabernet Sauvignon, Zinfandel and Merlot. I purchase these from a local distributor who imports California grapes every September. I had also come to appreciate many different commercial wines over the years. The conclusion that all the current knowledge had drawn me to though was this: Sadly, I could not grow the type of grapes I needed to make the types of wine that I love to drink. What and indescribable let down that was. You see, all the available expert advice coupled with the historical meteorological data said that Vitis Vinifera, the grape used to make the highest rated wines (ie; Cabernet Sauvignon, Sauvignon Blanc etc.) could not handle the climate in New York's Capital Region. I was crushed ( no pun intended), yet determined not to give up. Along the way, I had read about French-American Hybrids. These were exactly what their name implies; hybrids of Vitis Vinifera (wine grapes) and the cold hardy, disease resistant native American varieties, which make great jelly and juice, but terrible wine. Without going into way more detail than I already have, these varietals were created during the late 1800's in an effort to develop wine grapes that could resist the phylloxera root louse, an unintentionally imported American pest that pretty much wiped out all of France's vineyards at that time. These hybrids combined the natural phlloxera resistance of the American vines with the superior wine quality of the European vines. The problem was later resolved by grafting European vines onto American rooststocks. An unintentional feature of these hybrids though, was much hardier cold tolerance. You see Vitis Vinifera requires a long warm growing season and winter lows not colder than say 0 to -10 degrees Fahrenheit. I researched the record low in my area and found it to be -28 degrees Fahrenheit. Not good for me. This is where Cornell University came in to play. I learned about varieties like Chambourcin, Chancellor and Marechal Foch. 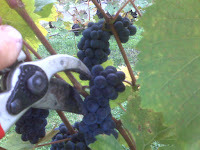 These grapes could handle the cold, were planted widely in the Finger Lakes and Canada, and made into commercial wines. These numbers coupled with the taste and condition of the fruit, have me very excited about the wine potential. So far the early results are super promising. I'll keep you posted along the way. Please tell me how you processed your Foch. With those super numbers, did you do skins-on fermentation? I have tried different types of macerations with foch over the years. 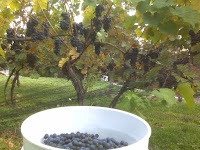 The best I've found is a 3-5 day maceration with very ripe grapes. If numbers are not as good, lean toward the 3 day mark. NO stems!This is very, very important and be careful not to press too hard or long. Oak it well and a solid year's worth of aging is a must. 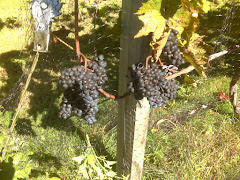 My Marechal Foch is ripening nicely and almost ready for harvesting (22 Brix). But i am a bit disappointed with the results of last year (thin and a bit acid), so i am looking for advise on the internet. can you advise on the type of yeast, what you found as optimal acidity and rest-sugar and on using a malolactic fermentation or not. hello ,my name is jOhn ,i am in Colorado ,i just started to make wine this year with Foch .i had only 80 lb about . i left it on very slow fermentation , outside , very cool night , i just press it , the juice was very aromatic and fruity ,anyway it was very plaisant so fare . I am new to Hybrid , but due to severe cold in my area ,i am looking more to it , well will see . 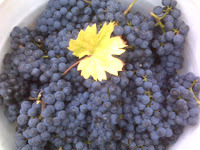 i pick very late , sept 29 ,and after pressing the brix was 17. I am a big fan of your site. I am planning on buying a vineyard myself and finally settle down doing what I really like doing. Thank you for keeping me inspired!